All students shall have the opportunity to achieve their potential through varied educational programs designed to meet their needs. Desert Mountain Elementary students strive for "Coyote Qualities" and through communication and cooperation we create an enthusiastic learning climate together! 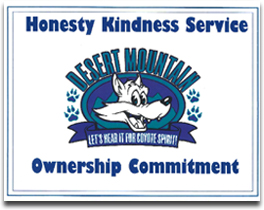 Honesty, Kindness, Service, Ownership, and Commitment.